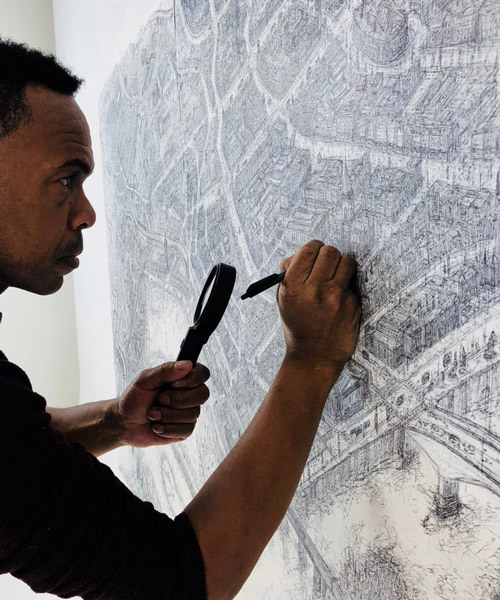 in an ambitious portrait project of the UK, self-taught artist carl lavia is creating immensely detailed illustrations of the island nation’s 69 cities from an aerial point view. 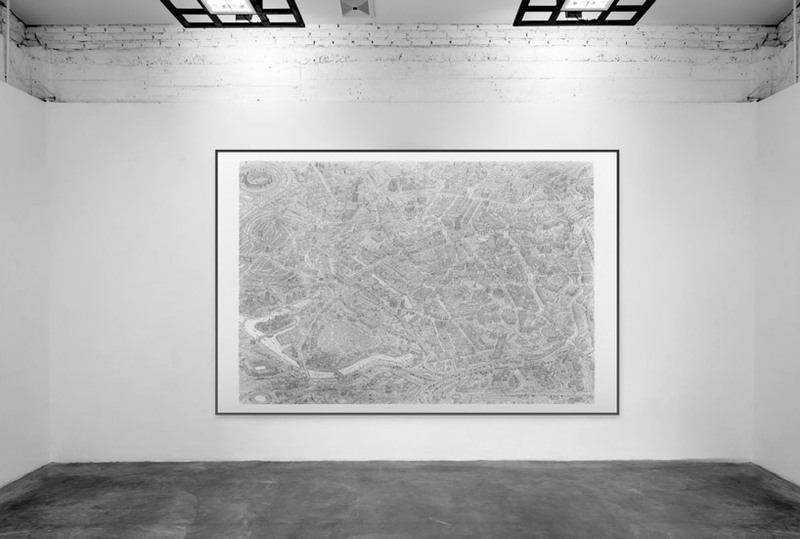 with the help of photographer lorna le bedonchel, the pair use ink and archival paper to produce each drawing, which appear like maps from a distance, but reveal a lightweight impressionist style on closer inspection. 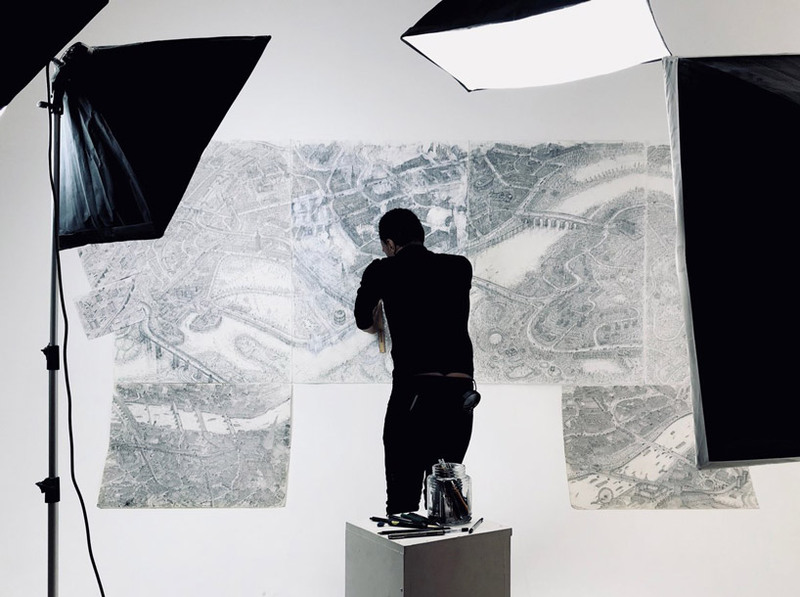 in 2016 sketch artist lavia joined forces with photographer lorna le bredonchel to form the ambitious ‘69 cities of the UK‘ project. 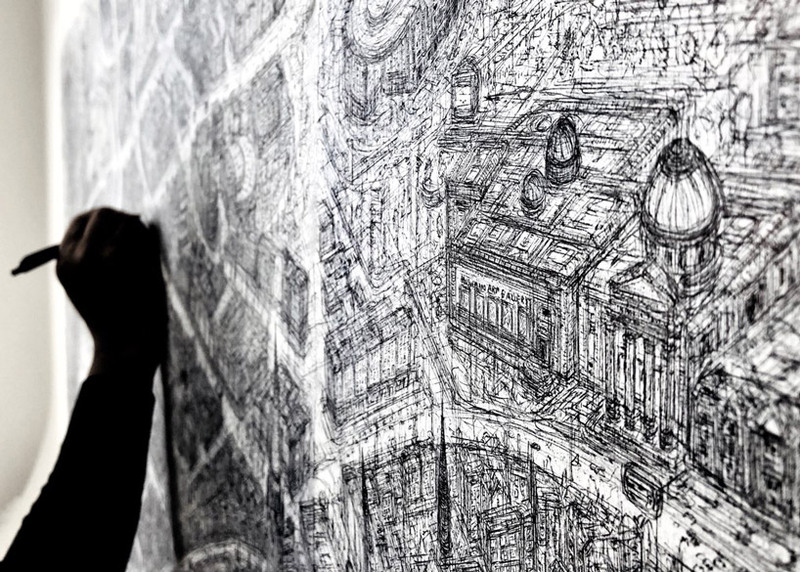 together they are documenting every single city within the UK through large-scale drawings. each artwork takes between 2-4 months to create and is placed on public display within its respective city. lorna begins by forming a basic pencil ‘scaffold’ which carl then layers over with minimal guide lines using ink. 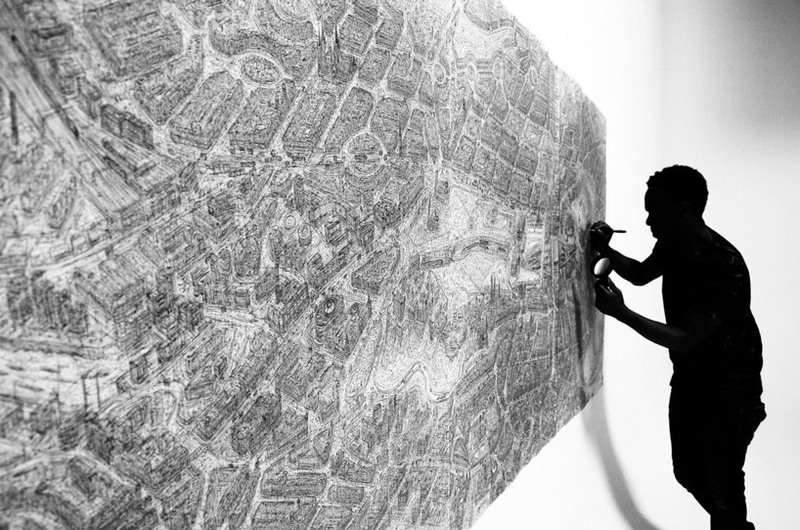 forming a more defined skeleton of the city, the work is fleshed out over time by constant layering (and erasing of lines) to solidify the intricate city structures in black ink. lorna documents the process until the sketch is finished. 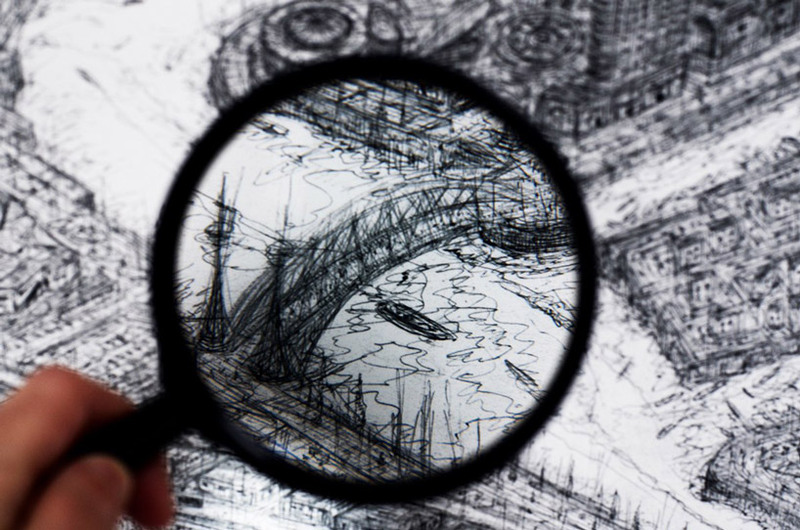 at first glance, the work looks like a traditional map, showing an aerial view of roads, bridges, streets, familiar buildings, monuments and well known landmarks. a closer inspection reveals a lightweight impressionist style, structures hovering and disintegrating, suggesting the process of creation, collapse and re-creation, mirroring the rhythm of the city itself, a complex network of lines tying and unravelling, an urban landscape in perpetual, dynamic transformation. 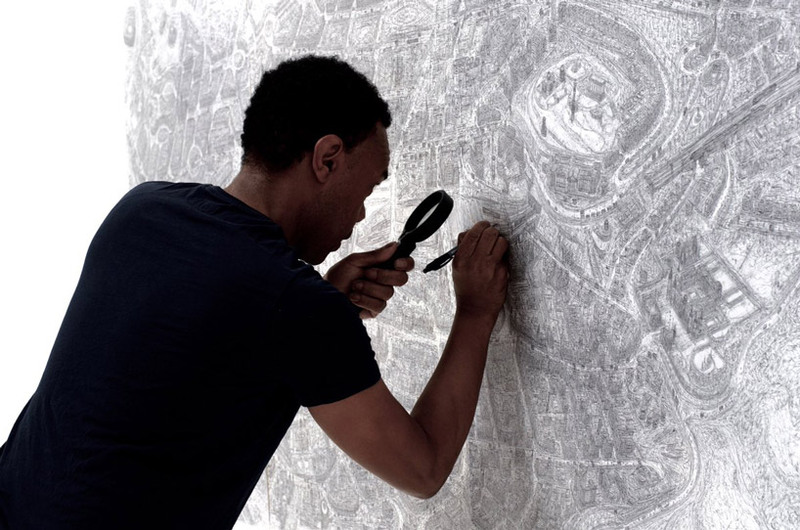 carl and lorna began their collaborative project in birmingham and have since documented the cities of manchester, edinburgh, dundee, stirling, and perth, scotland. 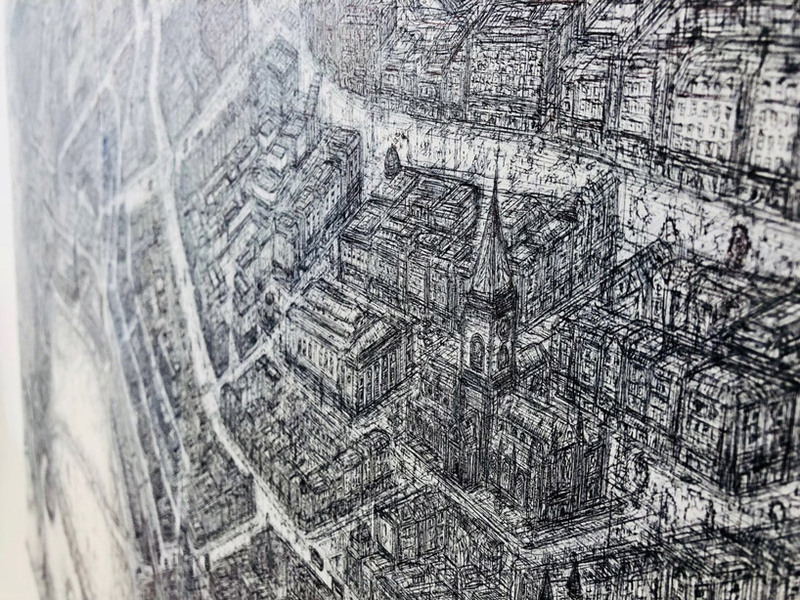 exhibitions have so far been held at a number of significant locations including birmingham museum & art gallery, as well as the central libraries of manchester and edinburgh. 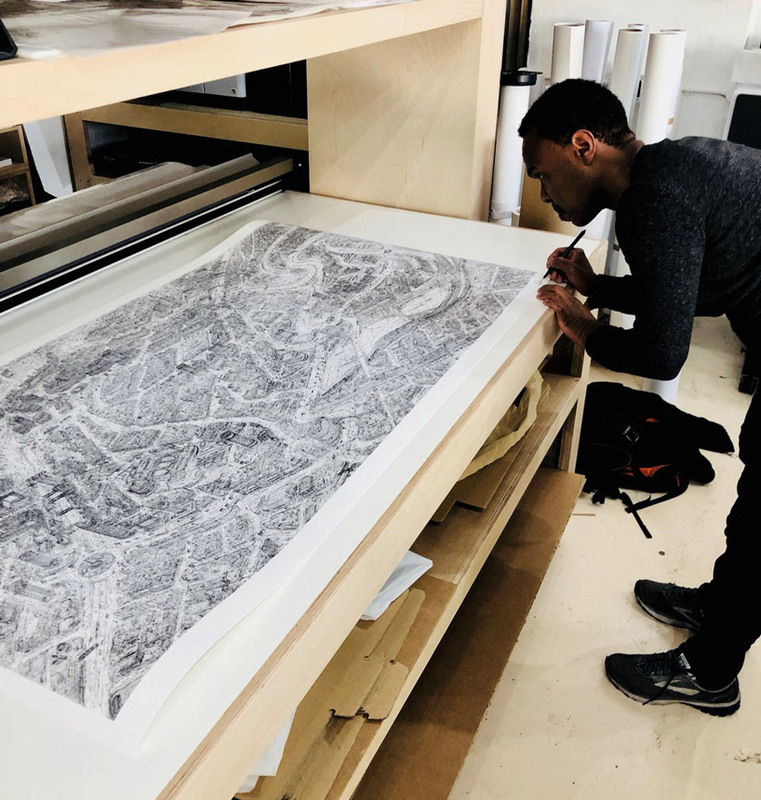 the pair are currently working on the perth drawing that will be on display at the perth museum and art gallery at the end of this month until january 2020. as well as continuing to explore the UK’s cities, they hope to develop an app that will allow visitors to explore each drawing in an immersive 3D landscape.